There's much more to this relatively unknown town than you might think, from stylish camping to visiting a ghost town. Ask most people outside of the White Mountains where Albany is and they’ll most likely tell you it’s in New York. But anyone who has spent any time at all in the mountains has probably been through it multiple times without ever knowing its name. 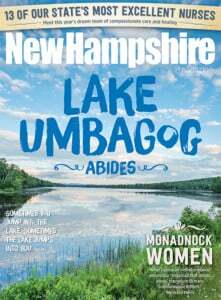 For a virtually unknown town, Albany contains plenty of well-known attractions, including the Kancamagus Highway and one of New Hampshire’s most beloved icons — Mt. Chocorua. It also has a covered bridge, several waterfalls, a favorite swimming hole and one of the few places in the White Mountains that’s on the National Register of Historic Places. You can camp, stay and dine in a luxury inn or eat French crêpes for breakfast in the woods. It has miles of trails and a ghost town. In all, that’s a pretty impressive list of reasons to go there. Albany was one of the original grants given to soldiers who fought the French at Louisbourg in 1745, but wasn’t incorporated and named Albany until 1833. By then, the village of Passaconaway was a thriving logging settlement of homes, a school, a sawmill and its own post office; in the 1850s it had as many as 1,500 residents and was eventually served by two logging railroads (the route of one of these is now the Kancamagus Highway). But by 1930, the surrounding mountainsides were timbered out, the rails had moved to new forests and the last resident — Ruth Colbath — died. All that’s left now of the ghost town of Passaconaway is her home and a cemetery. The story of Ruth Colbath is a favorite one in White Mountain lore, related at the Russell-Colbath House, which is now a museum of life in this community, displaying finds from the surrounding property. Her husband Thomas left home one evening in 1891, so it’s told, telling her he’d return shortly. That was the last she saw of him, but she left a candle burning in the window every night until she died, just in case he returned. Behind the house is the Rail ’n River Trail, a half-mile ADA-rated interpretive trail to the Swift River, with signs describing the 19th-century logging and railroads here. The Swift River is aptly named, for in the dozen miles it flows alongside the Kancamagus through Albany, it drops about 700 feet (to the thrill of whitewater kayakers in the spring), plunging dramatically over two waterfalls (which all but the most foolhardy portage). At Upper Falls, more commonly called Rocky Gorge, the river is squeezed into a rushing froth between two 20-foot rock walls as it drops about 10 feet. Lower Falls is wider, with flat, water-polished ledges, pools, chutes and a couple of tiny beaches in the summer. It’s a very popular swimming hole, and on warm days the parking lot is filled to overflowing. Though it’s lovely in the summer, it’s at its most spectacular in the spring when the river is swollen with melting snow from the mountains. Four National Forest campgrounds are located right along the Kancamagus in Albany — Jigger Johnson (named for a colorful lumberman), Passaconaway, Blackberry Crossing and Covered Bridge, named for the nearby 120-foot Albany Bridge that spans the Swift River, built in 1858. Among the four, they have more than 100 campsites, and there are 28 more at White Ledge off Route 16. The strenuous 4.5-mile Carter Ledge Trail up Mt. Chocorua leaves from the White Ledge campground, and the easier (hence more popular) Piper Trail begins farther south in Albany. A third popular trail climbs past Champney Falls to Chocorua’s summit, its trailhead is on the Kancamagus, west of Rocky Gorge. For a more luxurious take on camping, the French firm Huttopia opened a campground in Albany last summer, with well-furnished safari-style tents (some with equipped kitchens and indoor plumbing), rustic cottages and traditional campsites. The place is spotless, the facilities polished. There’s a large pool, a lake with kayaks, a playground, a camp store with wine and beer, and a café on the terrace where you can get croissants or French crêpes and espresso for breakfast. And if you want to go really continental, there’s even a pétanque court. Camping — primitive or luxury — isn’t the only style of accommodation in Albany. Hidden on a hillside and surrounded by woods, and hiking trails and mountain views, Darby Field Inn is a lovely little world of its own. Strolling in the gardens or swinging in the hammock listening to the hum of bees and the chirp of birds, it’s hard to believe that busy Route 16 and the Conways are so close. Rooms — some with fireplaces and double Jacuzzis — are decorated in a comfortable non-fussy style, and throughout the inn are original works by local artists. The same local ethic rules in the dining room, Littlefield’s Tavern, where most ingredients are locally sourced, sometimes from as close as the inn’s own garden. Less than a mile from Darby Field Inn, the Tin Mountain Conservation Center is the focal point of the Rockwell Sanctuary and its network of nature trails through forests, around a pond and past a granite quarry from the late 1800s. Activities there include birding trips, wildflower photography workshops, and programs on climate change and ecology topics. The building itself is a showcase of solar-electric and solar-thermal technologies, and holds a library of nature guides and reference books on subjects ranging from astronomy and geology to gardening, ecology and sustainable living.